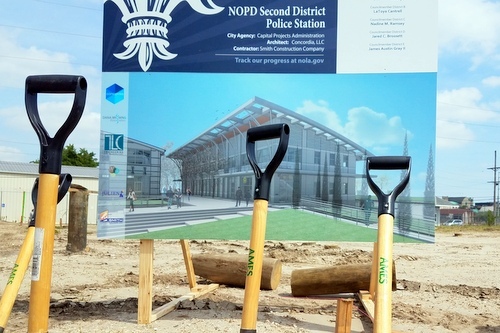 After at least four years of planning to move the officers of the New Orleans Police Department out of their cramped, decrepit building on Magazine Street, construction is finally set to begin on their new site in Gert Town, Mayor Mitch Landrieu said Wednesday morning. The current Second District station on Magazine Street was built in 1899 as a firehouse back when the pumps were still drawn by horses, and is so weather worn that officers take shelter at Children’s Hospital instead during major storms. After the city had close the building for emergency repairs to the termite-ridden structure’s sagging floors, Landrieu confirmed at a budget meeting in the summer of 2013 that the new building was planned for the Mary Church Terrell school site at 3411 Broadway Street in Gert Town. Then-Second District Commander Paul Noel (now a deputy chief with the department) praised the location, saying it would make officers more efficient because they would not have to struggle with parking. With quick access to a number of major traffic arteries, the site will also be more centrally located within the Second District — considering that the current building is actually in a tiny bubble of the Second District carved out of what would otherwise be the Sixth District. The 17,000-square-foot building is set to open in March 2018, officials said. 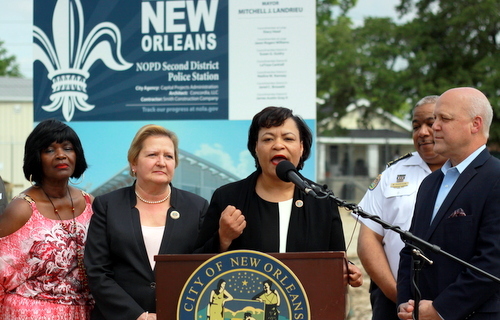 District B City Councilwoman LaToya Cantrell hailed the start of construction Wednesday morning at a groundbreaking ceremony at the site as a promise kept to the residents of Gert Town. Councilwoman Susan Guidry, whose City Council District A also includes much of the NOPD Second District, said she would have initially preferred a location in Hollygrove. After the selection process concluded, however, she said she too concluded that the old Mary Church Terrell school site was the best location. “Of course I wanted them in District A, but I had to admit, looking at the greater good, this was the place for them,” Guidry said. 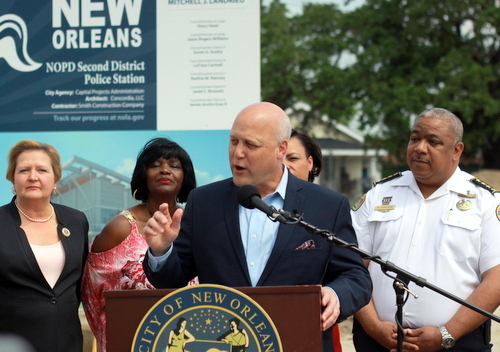 Landrieu said that the Gert Town area has actually been the recipient of massive new investment over his seven years as mayor, pointing to the rebuilding of Xavier University behind him, the new Costco across the street, the shops around Rock N’ Bowl, the return of Dunbar’s restaurant, and the housing for artists at the renovated Blue Plate building. Adjoining the police station will be a new indoor pool and recreation facility. While the new building will give Second District officers more room, it is not immediately clear that there will be many more officers to fill it up. Landrieu and the City Council instituted a hiring freeze in 2010 that would ultimately plunge the ranks of the NOPD from more than 1,500 officers when Landrieu took office to around 1,100 five years later despite a goal of returning to the previous levels. An aggressive recruiting campaign has staunched the annual net losses of officers from the department, and Landrieu touted the 12 police department classes that have graduated in recent years as well as the 15-percent increases in their salaries. That recruitment drive, however, has struggled to push the net total of officers much higher. The department has only grown by fewer than 10 officers per year since hiring restarted, a pace that makes the city’s often-stated goal of returning to more than 1,500 officers still over the horizon. Part of the difficulty of hiring more officers, Harrison said, is due to factors beyond the city’s control. Police departments all over the United States are trying to rebuild their ranks, so New Orleans is competing nationally for recruits. Meanwhile, Harrison said, the number of people who want to become police officers each year is naturally small, and may be further reduced due to anti-police sentiment around the country. Let us hope that the old building, probably designed by Thomas Sully, will be sold to someone that will preserve it and renovate it into it’s former beauty. Just as the owners of Cure did with a similar building on Freret! Great Mag St location for something! Man wounded in Danneel Street shooting, police say Danae Columbus: Which Landrieu cronies will be picked to redevelop Jazzland?